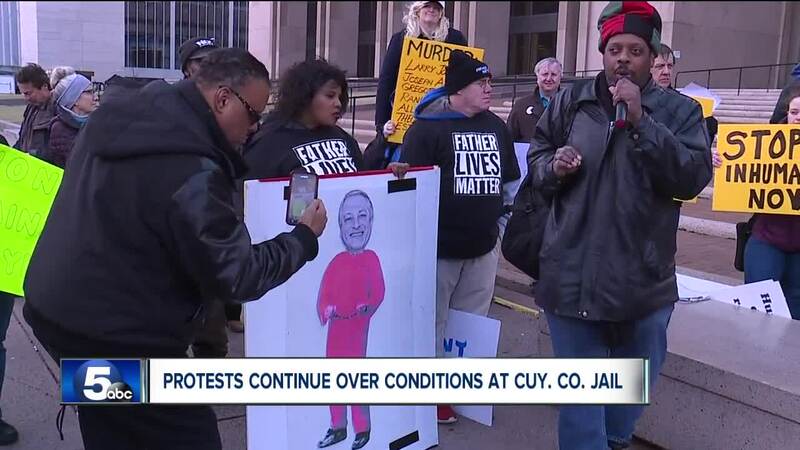 Protesters converged on the front steps of the Cuyahoga County Jail and Justice Center Tuesday afternoon to call for a series of changes at the county lock-up, in addition to greater accountability of county officials in light of the continued controversy concerning the county jail. CLEVELAND — Protesters converged on the front steps of the Cuyahoga County Jail and Justice Center Tuesday afternoon to call for a series of changes at the county lock-up, in addition to greater accountability of county officials in light of the continued controversy concerning the county jail. The Coalition to Stop the Inhumanity at the Cuyahoga County Jail, which is comprised of more than a dozen community activist organizations, compiled and later delivered a list of demands to various county leaders, including County Executive Armond Budish, members of the County Council, Sheriff Clifford Pinkney and various judges. The list of demands contains more than a dozen changes the coalition wants the county to implement. The demands include bringing all Cuyahoga County jails into compliance with the minimum standards for jails in Ohio; implementing a zero tolerance policy for correctional officer misconduct; a massive cleaning of the jail facility; ceasing coercive pressure to plead out to a lesser charge; providing full access to healthcare services; implementation of bail reform; thorough and transparent data collection as well as the implementation of independent oversight. The group’s demands come after at least eight inmates have died in recent months. More than 50 inmates have attempted suicide in the past year, according to a scathing federal report completed by the US Marshals. The US Marshals report also detailed questionable and potentially unconstitutional enforcement policies that have taken place inside the jail. During Tuesday’s peaceful, hour-long protest, demonstrators frequently directed criticism to County Executive Armond Budish, alleging that he has been slow to act on issues at the jail. The protest also comes a day after News 5 reported a correctional officer faces discipline, stemming from an incident in which he is alleged to have attacked and placed a praying inmate in a chokehold back in early November. Sources say the inmate, who is a practicing Muslim, was told he had to pray in a different part of the jail. When he refused, words were exchanged and the Cleveland Chapter of the Council on American-Islamic Relations (CAIR) said the inmate "was then attacked from behind by a corrections officer, picked up and held off the ground by his neck until he felt he couldn't breathe, and then dragged in a chokehold over some distance, and slammed on his face onto the concrete floor." "Obviously if that occurred, there has to be steps taken," said Cuyahoga County Executive Armond Budish Monday morning after 5 On Your Side Investigators asked him about the allegations against the jailer. CAIR says it received letters from the inmate outlining the allegations. Along with alleging that his religious rights were violated, CAIR said in a statement, the inmate "believes the assault by the corrections officer was in retaliation for his speaking out to the US Marshal's personnel regarding conditions in the facility." In its report, the Marshal's review team noted "strong and consistent allegations of brutality, use of force punishment, and cruel treatment at the hands of the Security Response Team" against inmates. Back on the steps of the Justice Center, protest organizers said they expect county officials to provide a report on the progress being made at the jail by Martin Luther King Jr. Day. A county spokeswoman declined to comment on the protests or the protester's demands. In December, the county approved hiring a leading jail and prison consulting firm to review the Cuyahoga County Jail’s healthcare and security programs.